Gold Luck has been top-listed in the USDF rankings since it's inception. 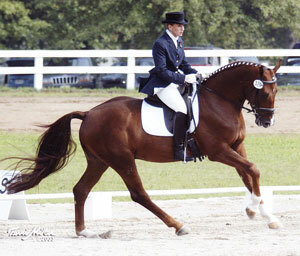 In 2003, Gold Luck was listed at #25 for the USEF dressage sires list, fourth place among domestic Hanoverian stallions. In 2004, Gold Luck was again listed as #25 for the USEF dressage sires list and was in third place among domestic Hanoverian stallions. The two domestic Hanoverians ahead of him are from earlier birth years and are now deceased. In 2005, he continued his success and was listed as #24 among 1161 stallions, 4th place of all domestic Hanoverian stallions, second among those still living. He is listed as the 4th highest producer of dressage sport horses in hand. I am listed as the 3rd highest ranked breeder of dressage horses and the 3rd highest ranked breeder of dressage sport horses in hand, based entirely on Gold Luck’s offspring. Visit the USDF Points and Awards page to see the standings for this year and seasons past. We are looking forward to upcoming competition years as there are several more Gold Luck offspring set to enter the show rings!